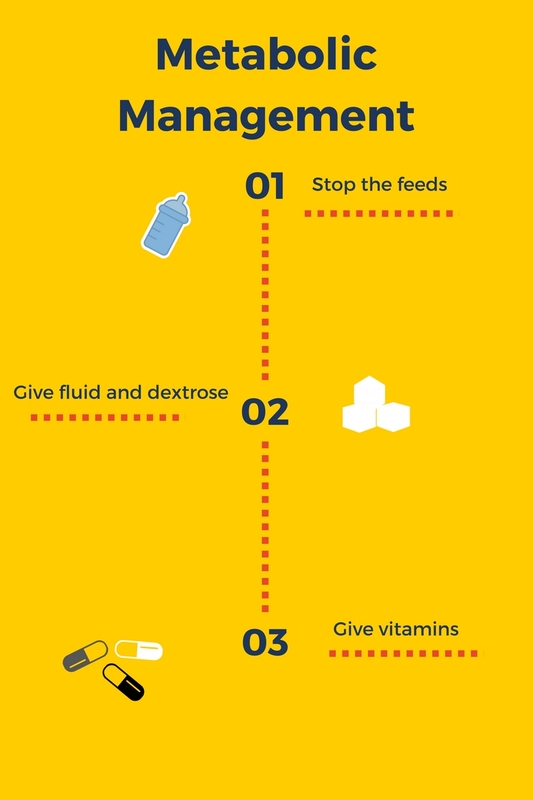 When a baby (In this context, thats any child that stays within 1 metre of where you left them for five minutes) presents with vague symptoms, the emergency physician should consider five broad categories of causes to the problem. Fig. 1 The big five causes of a baby being non-specifically unwell. If this were a Wilder Penfield diagram, the thumb would be bigger than the rest of the hand put together. 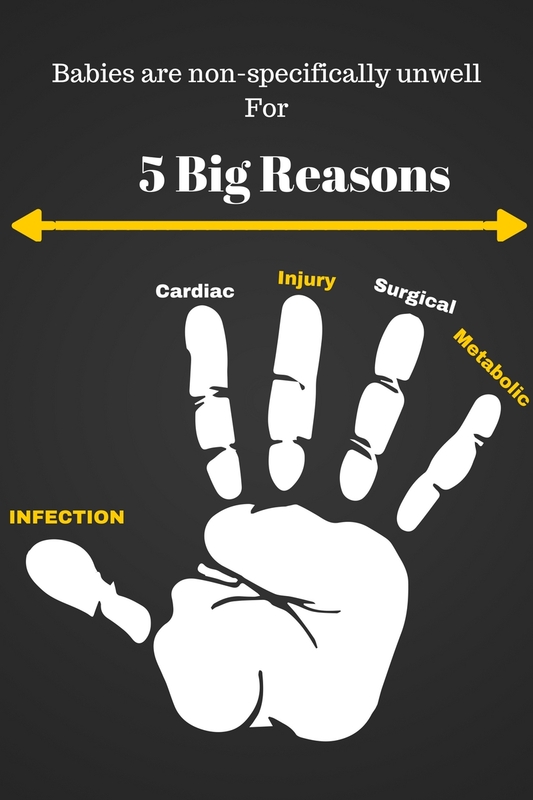 Of course infection is always the most likely but the others need to be considered. In all five groups, the likelihood is that the child will present with vague symptoms such as being less interested in feeds, being miserable and doing non-specific things like vomiting. Children with metabolic disorders can also present just like this. The best way to avoid missing a metabolic problem is to look for any clue of any of the big five listed above. If there is no clear explanation for the child being off, dont just think metabolic. The other causes (dont forget that injury includes NAI) are just as important and need to be actively considered. A capillary or venous blood sugar level is a routine (and I do not use that word lightly) test in any baby who is just not quite right but for non-specific presentations there are a few more that will increase the likelihood of detecting a metabolic problem early. The simplest of these is a blood gas. Septic and otherwise ill babies have moderately raised lactates. In some metabolic disorders the lactate is disproportionately high and may be in double figures. Similarly unexpectedly high or low pH results should prompt further consideration of a metabolic problem. If your gas machine gives electrolyte results, look at these. They may be really abnormal if this is a metabolic problem. For example, congenital adrenal hyperplasia can present with hyponatremia, hyperkalaemia and shock. If you are getting a good free flowing sample when you place a cannula, first obtain your usual sick baby tests (Culture, FBC, U&E, Ca, LFT, CRP etc) and then fill one more of each bottle (plain, fluoride and heparin) with blood. Your department may have specific bottles that they want in these circumstances so check before you stop taking your sample. One sample that needs special treatment is the extra Lithium Heparin sample. This needs to be cooled by having an adjacent bag of ice and it needs to be tested by the lab within an hour if you are to get a useful ammonia result. Early diagnosis and intervention are very important in the long-term outcomes for children with inborn errors of metabolism. How do you do that when you dont know what the problem is? When a baby presents with vomiting, a lactate of 12, a sodium of 124, a pH of 7.67, dysmorphic features and purple urine, do you know what the diagnosis is? No? Neither do I and I just made the whole thing up. One of the fallacies about metabolic problems in babies is that you have to have learned and understood metabolic medicine. You dont need to know what the problem is to make a big difference. 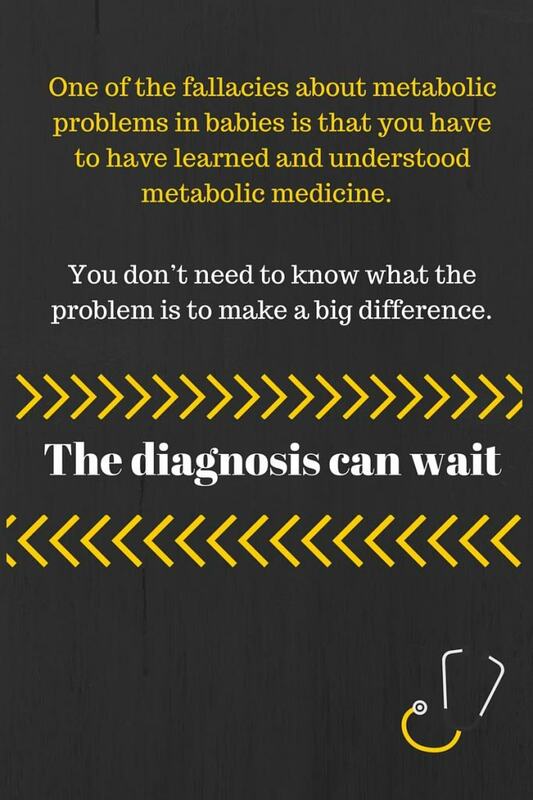 The diagnosis can wait. There are just three things that are going to help in the first stages. First, stop the feeds. Most metabolic pathways that go wrong are trying to process complex carbohydrates, fats and proteins. Confiscate these immediately if you want to make sure the condition does not worsen. Second, give fluid and dextrose. Whatever the toxin, dilution is usually a good thing and the chances are that the baby is fluid depleted. 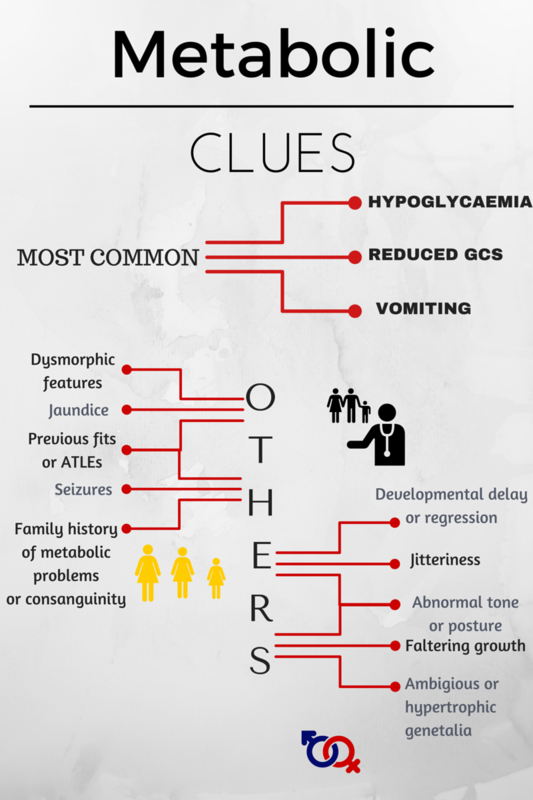 If indicated by the clinical situation (poor urine output, tachycardic, etc.) give a fluid bolus. As well as any fluid resuscitation with isotonic fluid, maintenance fluid with 10% dextrose should be given. 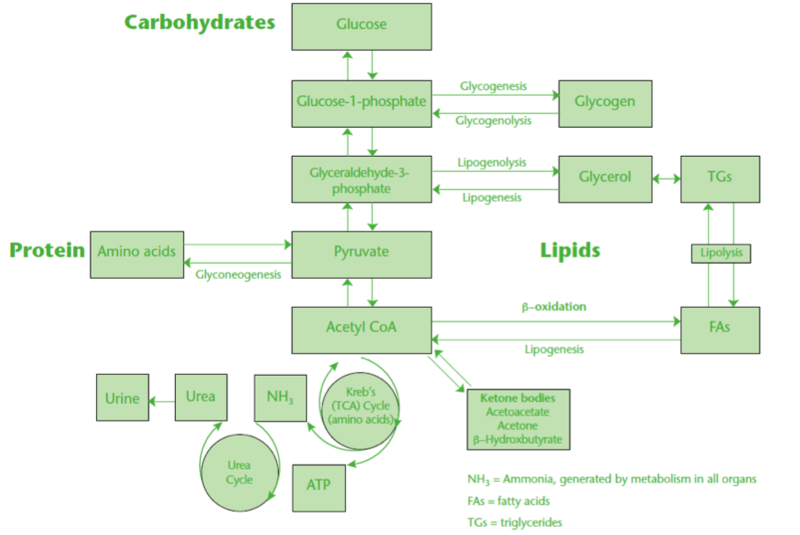 This generous carbohydrate supply will shut the majority of the metabolic pathways down (fig. 3). The sodium and potassium concentration of the maintenance fluids will depend on other factors and serum levels will need to be monitored closely. If necessary ask your ICU or neonatal unit to provide help providing special combinations such as 10% dextrose with 0.9% NaCl if needed.